Michael Dunlop on the Tyco BMW S1000RR. Michael Dunlop has unveiled the 2019 Tyco BMW livery at a business launch event at a hotel in Ballymena. Dunlop was joined by British Superbike rider Christian Iddon as they pulled the wraps off their S1000RR machines. Ballymoney racer Michael Dunlop's Tyco BMW S1000RR Superbike. The Ballymoney man is entering his second stint with the Moneymore-based TAS Racing team this season after winning the Superbike race at the Isle of Man TT in 2018. Dunlop will also run a BMW Superstock machine under his own MD Racing banner this year, plus a Supersport bike. 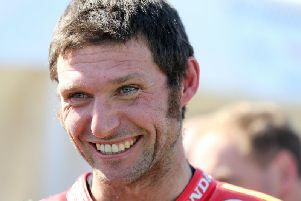 The 29-year-old has also announced his plans to run a second rider in his MD Racing team on a Supersport machine. John McGuinness had been due to ride a Honda CBR600RR for Dunlop last year until he was ruled out of the TT following an injury setback. In an interview as a brand ambassador for D3O impact protection gear, Dunlop said: “My main thing is to win races. It always has been and it’s the only reason why I do this job. “I love riding motorbikes, but my main aim is to win races. We’ll just try our best and if that’s good enough, great. If it’s not, then it’s my fault really.